A pack of beauty essentials that is a must for every makeup lover is right here listed for you guys. Store it in your makeup organizer and forget the hassle of finding your essentials last minute. With a good acrylic cosmetic organizer you can store all your stash in a neat and organized way. Here is the list. Concealer: The perfect solution to cover blemishes and hide your under eye circles. A creamy formula can sort it out for you - concealer. Foundation: A cure to cover patches on your skin, discoloration and uneven skin. All you got to do is apply it where you find unevenness and you are good to go. One can also use a tinted moisturizer in place of foundation. Blush: Give that slight blush to your cheeks and give your face a warm tone with the perfect blush tone. Translucent powder: This is a powder that gives your makeup a quick and light dusting and also sets it well with some shine. Mascara: The most appropriate way of flaunting your lashes is by giving a touch of mascara to your eye lashes. A dark brown or a basic black would do for any skin tone. Neutral eye shadow: Add that tone to your eyes by adding a slight tint with a taupe or beige and brighten it at the lid. Defining eye shadow: Eye shadow with a charcoal grey shade or a dark brown gives your eye makeup a little warmth and brushing it on the eyes' crease and below brow bone gives your eye shadow a little more of depth. Eye liner: Enhance your eyes with a dark brown or black shade of a thin eye liner across the lid or use the darkest shade of eye shadow along the lashes as an eyeliner. Give your eyes a fresh look with an eyeliner. Lipstick: Gives the perfect look to your lips with the right choice of color to match your skin tone and your dress. A lipstick or a gloss gives your lips the appropriate look it deserves. Powder Blush: To give your makeup its finishing touch, rub the powder blush with a rounded brush across. Blush brush: Smaller in size than the powder brush, is used for dabbing some color on the cheeks and blending it right with the cheekbones. Eye shadow brush: A brush that covers your eye lid with a tint in just a single swipe. 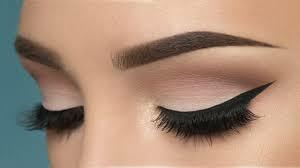 Clean up any stray hairs around your brows that sprout up in between brow appointments.